Re: Tom Sheriffs comments. You could be right about the derailment Tom, but if you look REALLY closely at the lower right corner of the tram you can see what appears to be a piece of track, so I think it had just come over the points and onto another track. Not saying I am right and you are wrong, just wondering! Also there appears to possibly be a wreath on the central light standard, so I wonder if these people are gathering for a remembrance service or funeral? I agree that if it was a 'Union' event there would be banners, Police etc, and many, many more people I suspect! 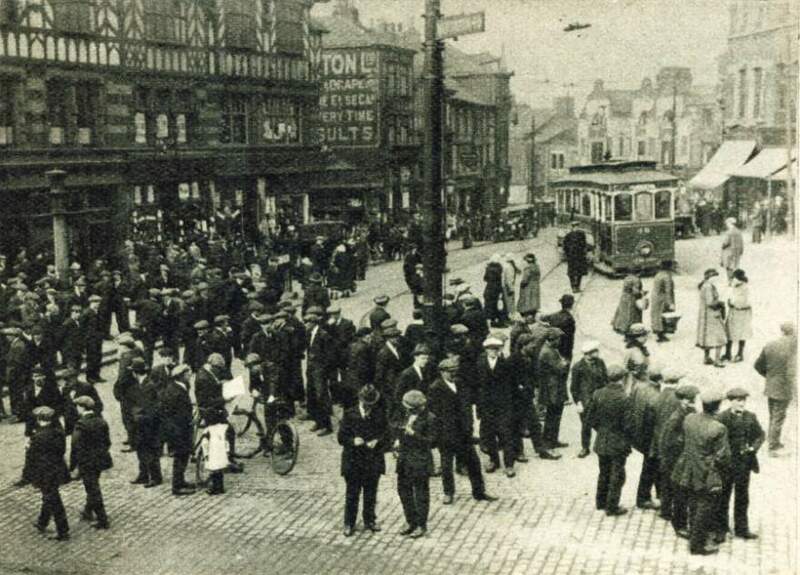 It would appear from a closer study of the photgraph that the tram in the background has come off the rails, and it would suggest that this has attracted a small crowd, as they are not dressed in working clothes this gives the impression of a Saurday afternoon. the absence of police, slogans and union banners suggests that this has nothing to do with a strike or similar protest. What a Great picture! My grandfather was a miner and was living just on the outskirts of Wigan at the time. I love seeing pictures of old Wigan.